Comments/Context: The otherworldly nature of the negative image has captivated photographers from the very beginnings of the medium. Pick up any book on 19th century photography and you’ll find negative images of Grand Tour destinations, the Sphinx or the Taj Mahal glowing white in an otherwise dark black world. Fast forward to today, where Vera Lutter’s large scale camera obscura images transpose light and dark, capturing cities and built structures in striking contrast. The fact is that even the most pedestrian of everyday snapshots can become puzzling and downright bizarre when the black and white tonalities are reversed; normal becomes abnormal in the blink of an eye. In his newest body of work, Richard Misrach has taken this relatively simple idea and updated it for the digital age. His works are color negatives, where all of the complex colors and hues of the spectrum have been “reversed”. Surfers now ride waves of cotton candy pink water and the towering rock formations of the Oregon coast look like frozen Antarctic icebergs. Up close rock walls and thickets of interlocking shrubbery become swirling all-over abstract designs. Tiny figures are now pinpricks of bright white. The danger with a project like this one is that it relies too heavily on a technical gimmick. I’m happy to report that Misrach has avoided the “parlor trick” effect for the most part by selecting scenes that are transformed in unexpected ways by the complicated palette switch. Given the surfeit of iceberg photography these days, the boulders and sand dunes turned icy blue and white seem all too familiar; while the scale makes the images more impressive and memorable, I think these compositions are in the end the least interesting; they are undeniably the most eye-catching when you first walk in, but after a turn around the gallery, I found myself drawn back to other more nuanced works. The palette reversal in the more abstract photographs is actually much stronger and more mesmerizing; it’s quite a bit less obvious and flashes of weird muted color splash across the images, highlighting unexpected textures. Tangled branches and sticks become pure Jackson Pollock; explosive lines run in every direction, intersecting and overlapping like dashes of ink. A sunny sea scene becomes a cream colored fabric, covered by black dots and sparkles. And the jumbled walls of rock are even more romantic and painterly, becoming blobs of thickly applied Abstract Expressionist paint. Again, the scale here is monumental, so the images encourage both getting right up close to peel back layers of information, and then moving much further back to see the forms coalesce. What I like best about these works is that while the images have a process-centric undercurrent of technology experimentation, the subdued colors in the resulting pictures have a expansive lushness that I found surprisingly enveloping. The exhibit is a soothing and meditative mix of greys, browns, blues and greens. While not every picture was a standout for me, I think the abstractions are both photographically original and quietly beautiful. All in, this body of work explores plenty of rich and thoughtful topics, and offers some truly new conclusions on the uses of color, the nature of the contemporary digital landscape, and the power of scale. Collector’s POV: While I wasn’t able to get detailed information on prices for this show, I was told the works on view range from $22000 to $90000, based on size. Misrach’s photographs have become consistently available at auction in the past few years, especially his earlier desert works that are generally smaller in size; these have rountinely ranged from $2000 to $12000, with a few outliers even higher. The newer works of more monumental size are just beginning to find their way into the secondary markets; these have ranged in price between $40000 and $80000 for the few lots that have come up for sale. For the sake of clarity, Misrach is not actually represented by PaceWildenstein (the venue of the show); he is represented by Pace/MacGill Gallery in New York. Given the size of the works, it is no wonder that a partnership was needed to display them. 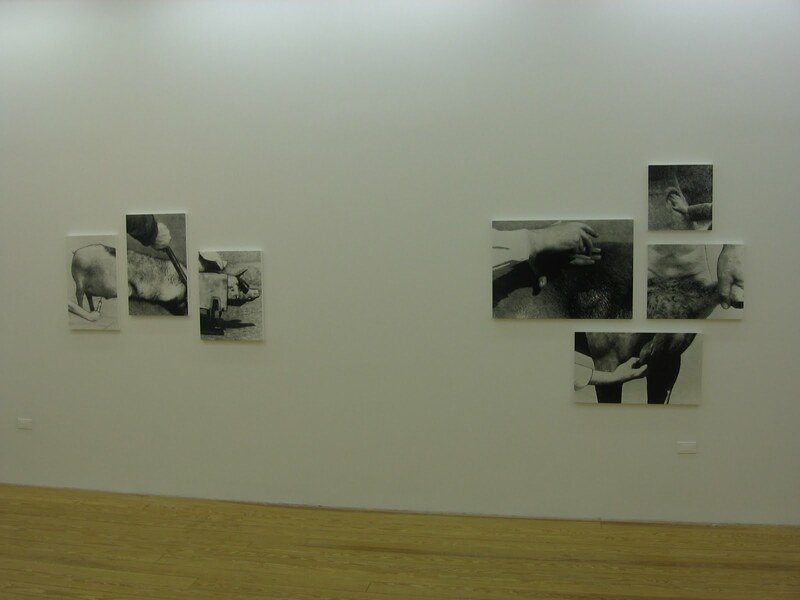 A selection of the images on view can be found on the Pace/MacGill website (here). Richard Misrach is also represented on the West coast by Fraenkel Gallery (here).